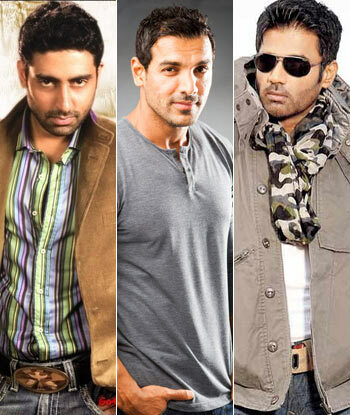 Rediff.com » Movies » Which actress should be cast in John-Abhishek-Suniel-starrer Hera Pheri 3? Which actress should be cast in John-Abhishek-Suniel-starrer Hera Pheri 3? Two schedules of Hera Pheri 3 have been completed with the film’s leading men Abhishek Bachchan, John Abraham and Suneil Shetty. But there is no sign of a leading lady yet! According to rumours, the film’s producer Firoz Nadiadwala and director Neeraj Vora are yet to zero in on the female leads. "It’s true we’ve shot two schedules of the new Hera Pheri film with only the heroes," Nadiadwala confirms. "The girls were not required until now. As we all know, Hera Pheri is a boys’ franchise. Of course, the leading ladies will have definite clear-cut roles but the plot will largely revolve around the heroes." Amy Jackson was reportedly being finalised opposite John Abraham but she has become a hot-seller after Shankar’s I, and may not be willing to play a decorative prop in this film. Which actresses would YOU cast in this film? Tell us in the message board below!